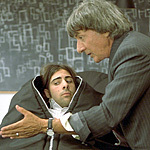 At the core of the comedy I ♥ Huckabees is a philosophical fight between existentialism and nihilism. That description alone would have gotten me into the theater. The fact that it’s David O. Russel’s first movie in five years (Three Kings was released in 1999) sealed the deal. And although I didn’t love the movie as much as I’d hoped, I’m happy to let it simmer and percolate like Three Kings, which I like better every time I see it. Albert (Jason Schwartzman) formed a little coalition to save a marsh and forest, but Huckabees department store wants to build on it. They also have an environmental image problem, so they send Brad (Jude Law) to infiltrate the coalition, bring Shania Twain on board if he has to, and take it over. Once the coalition is theirs, they can use the marsh as an advertising gimmick to improve their image. Meanwhile, Albert has gone to an Existential Detective agency, whose card he found by coincidence. He goes, hoping they can explain his repeated coincidental meetings with the same tall African man. The Existential Detectives (Dustin Hoffman and Lily Tomlin) take his case, and nudge him toward a philosophical reawakening, rather than just investigating his coincidence. A side character, Tommy (Mark Wahlberg), is going through his own philosophical rebirth that has cost him his wife and his child. “If nothing matters, then I don’t matter!” screams his wife. Meanwhile Tommy tries to teach is young daughter about sweatshops using “mommy’s pretty shoes” as an example. (Wahlberg’s character’s biggest complaint with the modern world is petroleum, a problem he carries over from Three Kings, in which Wahlberg’s character was tortured by an Iraqi — Said Taghmaoui, who shares an early scene with Wahlberg in Huckabees — using crude oil). Through the Existential Detectives, Tommy takes Albert under his wing. But Tommy has been recently seduced by the nihilists — by author Caterine Vauban (Isabelle Huppert) in particular, who seems to be trying to steal the clients of the existential detectives one by one. The cast is great in this vibrant, energetic movie. The half-dozen top-billed actors are all wonderful in their roles. Their characters each spring to life, and yet they all fit together as an ensemble, too. Dustin Hoffman’s excitement has to be restrained by Lily Tomlin. Jude Law’s cocky smugness fuels Jason Schwartzman’s paranoia. Mark Wahlberg’s run-on mouth and Naomi Watts’ (as Brad’s girlfriend and Huckabees’ spokesmodel) obsession with being pretty add to controlled chaos of Huckabees. Comically bad hair abounds in this primary-color world. Dialogue is snappy and the pace is quick. You could watch the movie twice and just look for jokes hidden in the corners. The sheer kinetic energy in Huckabees makes it fun to watch. On the other hand, I’m not sure I needed to see the image of Schwartzman sucking on the milky breast of Jude Law. Nor was I entirely convinced by Schwartzman’s roll in the mud with Isabelle Huppert. And I’m not entirely sure of the movie’s philosophy. Someone else called the philosophy of the movie “dime-store philosophy,” but I think that’s probably too simple a dismissal. Besides, what movie even bothers to raise philosophical issues? If I had taken my philosophy-doctorate friend to see the movie, he might have picked up on some underlying joke in the fight for souls between the existentialists and the nihilists. A little cursory research hasn’t revealed any major faux pas in the film. Then again, my pal may have said it’s all just so much psychobabble. And the movie probably is a little too facile about it all. For a movie with philosophy at its core, you’d hope for something the philosophy students would get a kick out of, and not just the pseudo-intellectuals. And maybe it will appeal to philosophy students, but at this point I’m just not sure. If I can convince my friend to see this film, I’ll post his response here. In the meantime, what this review is, is what it is.